Congress’ recent directive to Medicare to ease the burden of hospital readmission penalties on safety net hospitals that serve low-income patients was definitely a step in the right direction. After all, once patients with high social needs are discharged, there is much that’s outside the hospital’s control. It isn’t fair to penalize providers when they tried to do the right thing but their patients face challenges such as a lack of stable housing or the inability to pay for their prescribed medications. Of course, that doesn’t mean we should return to the pre-Affordable Care Act norm of letting these patients fend for themselves; that doesn’t solve the core issue of helping these low-income populations get and stay healthier. A smarter approach would be for the government to support those hospitals’ obtaining advanced analytics that can not only identify those patients at the highest risk of readmission but also those who are willing to follow the plans of care their physicians prescribe – if they can get a little help in overcoming the barriers created by social determinants of health. By combining clinical, socioeconomic, psychographic, behavioral health and other types of data, safety net hospitals can gain a better understanding of the specific social obstacles each patient faces, such as a lack of transportation or healthy food choices in their neighborhoods. They can then implement care management programs or work with outside agencies to help patients resolve those issues. For example, a physician at the hospital may prescribe a medication to control the HbA1c level of a morbidly obese diabetic patient with neuropathy. But if that patient lives in a suburban apartment, she may not be able to receive bulk mail order supplies because they don’t fit in her mailbox. If she doesn’t have transportation to the post office, she isn’t able to pick up her order because she is unable to walk a mile-and-a-half each way. That makes her a readmission waiting to happen. But if the hospital is aware of these challenges, the clinical team can work out an alternative, such as free rides provided by a social service agency, that enable the patient to obtain affordable bulk medications. Another common social determinant of health, especially among the elderly, is depression because of loneliness. A patient who is depressed is less likely to follow his plan of care, including taking medications to combat the depression. If this potential barrier is identified and understood, the hospital can start its own program or work with local social services agencies to provide companionship, encourage the patient to get out of his house or apartment and participate in social events, or join a support group of seniors in similar situations. In an ideal world, safety net hospitals would be able to help all patients with whatever they need, no matter the circumstances. In reality, however, these hospitals have very limited resources (human as well as financial) and thus must ensure they are investing those resources where they will do the most good. That is why the analytics must do more than identify needs. They must also identify the impactability and intervenability of those patients so priorities can be set. By assigning an impactability score to each patient, the hospital can determine where closing care gaps will deliver the best return on investment, both clinically and financially. 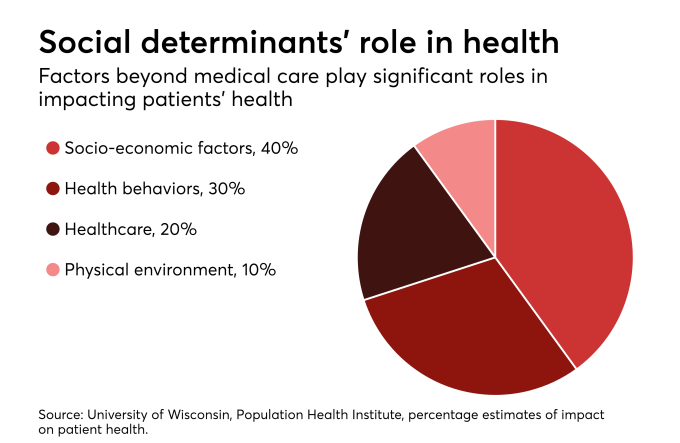 In other words, if one patient has several major care gaps while another with similar conditions and demographics only has one or two minor ones, the greatest potential to impact readmissions is with the first. That’s only half the equation, however. The other half is how willing those patients are to participate in their own care. If two patients have high impactability scores, but only one has demonstrated a desire to do what it takes to improve his or her situation, the hospital’s limited resources will best be spent on the one whose intervenability score shows greater willingness. Here’s the challenge—while safety net hospitals are often the ones that could most benefit from these types of analytics—especially those that are in areas with low health literacy or a cultural bias toward certain chronic conditions such as diabetes and heart disease—they are also most likely the ones who can least afford them. That’s where government help is needed. Simply removing penalties isn’t enough. By appropriating funding to help safety net hospitals acquire these types of advanced analytics, Congress (or other governmental agencies) can help make a real difference in the overall health of this country’s most vulnerable populations. They can also help make a dent in the cost of serving them. Yes, it’s a long play, which can be a tough sell in our instant-everything world. But it’s one that will ultimately pay huge dividends. Not just to the patients of safety net hospitals but to the taxpayers, as well. Michele Norton, MS, RN is senior vice president of healthcare strategic marketing at SCIO Health Analytics.